Wreaths, twinkling lights, Christmas carols and hot cocoa are calling my name. It’s the most wonderful time of the year and I feel so thankful that all of you have been with me for so long. This blog goes back quite a ways and each time the holidays roll around I am reminded about how fortunate I am to do what I love. November is my month for shopping. I really try so very hard to be done with my list so that I can fully enjoy December and the time with my family. Are you similar or do you prefer the hustle and bustle of last-minute shopping? In hopes of making things easier, I am kicking off my holiday gift guides today. The Cozy Girl Gift Guide was one of last year’s most popular guides, so I’ve updated it for 2018. Perfectly priced pajamas and so darn cute!!! The run true to size. I just bought these in an XS and love them. They are very warm and will come with me to Park City, Utah this winter. I rounded up more cute holiday options in all price points. Scroll through and click on any image for more details. Every girl needs a beanie for the winter months. Why? Because it hides dirty hair. Let’s be honest. That’s the very best part. Plus they are super chic and add a lot to an outfit. Three more adorable options. The third one comes in one million colors and is currently on sale! All so cute for winter. The patchwork beanie has a matching scarf ( a bit price but I’ll watch for a sale). Whether you fill a mug with treats or a gift card or pass along a set of four, a classic Christmas mug never goes out of style. I also really like these initial mugs. Santa mugs Did any of yo have these growing up? Currently on sale and I love how they’ve brought them back. I have amazing memories of my mom making me hot chocolate in that mug. Spiced cider, anyone? You can’t go wrong with a delicious smelling candle and this beautiful one receives perfect reviews. I also like to buy sets of candles and split them up for teacher’s gifts. I will include the candle and a gift card to one of their favorite places. A Barefoot Dreams throw is the equivalent of giving someone a huge, warm hug. Truly. And you won’t find it for this price anywhere else. I also really love this version. These pom throws are on sale right now and make an epic gift for teachers or family members. So many slippers cost a ton of money and I’m not on board with that. These are $39 and so cute. Especially if you live in a cold climate and need to keep those feet toasty warm. Gingham is classic and so cute for winter. These plaid ones are ADORABLE. These babies make my gift guid every year. They are 100% awesome and I LOVE them. That is all. LOL. Seriously, they are soft and maintain their shape. And I don’t feel frumpy when I wear them. Grab one for you and a friend and they are only $30. This robe is a bit of a splurge but it’s FANTASTIC. Beyond soft and receives perfect reviews. I always appreciate a shorter robe and this one is ideal. Do you have a friend who is going through a hard time? I always think gathering a couple of girlfriends together and gifting someone this with a few magazines is such an easy way to say you love them. This one comes in at a lower price point but similar look. Of course if you are looking for soft, you can go wrong with the Barefoot Dreams cardigan. I wear mine all the time. The holiday shop is now open!!!!! I’m bringing everything to you in a one stop shop so that you can get your holiday shopping done early. Just click this button in my sidebar or select holiday shop from my menu bar. I will continue to update it as I add gift guides and special sale items. It’s more fun when we shop together, right?! I’m off to vote and then to visit Mama. Can’t wait to see her. Enjoy your day, friends. Thank you Courtney! I love that you are starting this early. Since our girls are close in age, I would LOVE some ideas for tweens and get an idea of what is on your daughters list for Christmas. 🙂 Looking forward to checking your Holiday Shop on a weekly basis! I have young two boys and two girls age 12,13 &14 to buy for this year. Any ideas would be appreciated. I read the reviews on the plaid pjs. They shrink! I plan to size up as recommended by previous buyers. 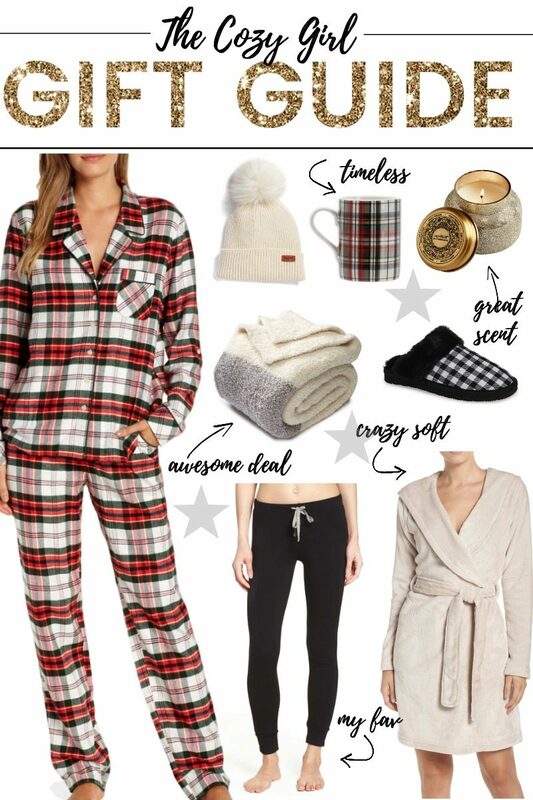 Love the plaid pajamas and mug too! So cozy and cute!